Different lumbers serve different purposes and can be used a variety of ways. For the sake of this writer’s purpose we’re going to focus on two: OSB and Plywood. Both types of wood can be used for walls, floors, and even roofs. This begs the question – which one is better? Keep reading to uncover the advantages and disadvantages of both. Back in the day all there was available was plywood until the 1970s when oriented strand board (OSB) became available. Since then, OSB has gained most of the market share due to its lower price point. 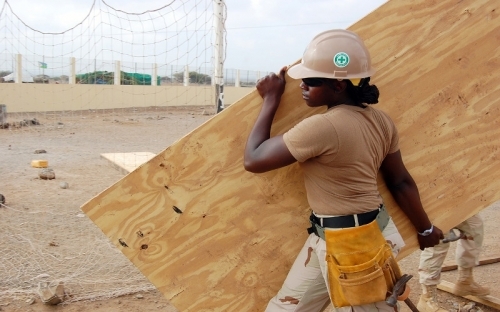 OSB sheathing is nearly three dollars less per sheet than standard plywood. OSB is more cost effective because its engineered by adhesives and layers of wood flakes achieving the same strength and durability as plywood, but at a more economical price. One of the big advantages of OSB is that its available in large sizes which is great if you’re a contractor working on a multifamily project. Panels can be manufactured as long as 24 feet because of their production. Plywood users are limited by the size of the tree; therefore, sizes are standard or smaller. OSB can be engineered and customized to meet the needs of the contractor in ways plywood can’t. It also carries good shear strength and consistency. Contractors can trust OSB more than plywood as the wood is never subjected to the nature of the tree itself. Because of how OSB is manufactured, mills can create a consistent product contractors have confidence in when used on the job. With all of these great benefits, it might be hard to believe there any cons, but OSB tends be much heavier and has been perceived to have a lower moisture tolerance. The many layers of flakes it takes to manufacture OSB makes it a much denser product than plywood which can be difficult to work with depending on the project and if your DIY. Back when it was first introduced into the market OSB did have some performance issues when exposed to moisture. Performing well when exposed to moisture is where plywood tends to stand out from its more resource friendly cousin. While manufactures have developed OSBs that better handle moisture, plywood excels in swelling evenly and drying faster than OSB. Plywood has a great reputation among craftsmen and DIYers. Its established high-level performance has been around long before OSB and tends to have a loyal following regardless of its retail price. Plywood sheets can occasionally suffer from weak spots which can cause core voids in the panels, a disadvantage of manufacturing thin sheets of veneer from logs. When it comes to which is better, OSB or plywood; it really comes down to your project and personal preference. Across America you see regional trends like in the Northeast where plywood is the preferred choice even though OSB still dominates most of the construction market. The biggest area for concern is determining how each option would handle moisture during the time of your project and the years to follow. If you’re worried about moisture, talk to your local lumber yard or hardware store professional to learn more about the OSB that’s in stock or available to order. Whether you choose OSB or plywood, use what’s going to work best for you.